Heterozygous glucokinase (GCK) mutations cause mild, fasting hyperglycaemia from birth. Although patients are usually asymptomatic and have glycaemia within target ranges, some are put on pharmacological treatment. We aimed to investigate how many patients are on pharmacological treatment and the impact of treatment on glycaemic control. Treatment details were ascertained for 799 patients with heterozygous GCK mutations. In a separate, longitudinal study, HbA1c was obtained for 16 consecutive patients receiving insulin (n = 10) or oral hypoglycaemic agents (OHAs) (n = 6) whilst on treatment, and again having discontinued treatment following a genetic diagnosis of GCK-MODY. For comparison, HbA1c before and after genetic testing was studied in a control group (n = 18) not receiving pharmacological therapy. At referral for genetic testing, 168/799 (21%) of patients were on pharmacological treatment (13.5% OHAs, 7.5% insulin). There was no difference in the HbA1c of these patients compared with those receiving no treatment(median [IQR]: 48 [43, 51] vs 46 [43, 50] mmol/mol, respectively; 6.5% [6.1%, 6.8%] vs 6.4% [6.1%, 6.7%]; p = 0.11). Following discontinuation of pharmacological treatment in 16 patients, HbA1c did not change. The mean change in HbA1c was −0.68 mmol/mol (95% CI: −2.97, 1.61) (−0.06% [95% CI: −0.27, 0.15]). Prior to a genetic diagnosis, 21% of patients were on pharmacological treatment. HbA1c was no higher than in untreated patients and did not change when therapy was discontinued, suggesting no impact on glycaemia. The lack of response to pharmacological therapy is likely to reflect the regulated hyperglycaemia seen in these patients owing to their glucose sensing defect and is an example of pharmacogenetics. The online version of this article (doi: 10.1007/s00125-013-3075-x) contains peer reviewed but unedited supplementary material, which is available to authorised users. Heterozygous inactivating GCK mutations cause mild, stable, regulated hyperglycaemia from birth [1, 2] as a result of a defect in glucose sensing . They are a common cause of MODY. Patients are usually asymptomatic and are typically diagnosed incidentally, as children, in routine medicals, or during pregnancy [1, 4]. Patients with glucokinase (GCK)-MODY rarely have HbA1c concentrations requiring pharmacological treatment  but some patients are treated with insulin or oral hypoglycaemic agents (OHAs) , especially when misdiagnosed as having type 1 or type 2 diabetes. The birth weight of offspring is similar for women with GCK-MODY who receive insulin during pregnancy vs those who are not treated with insulin . It is advised that pharmacological treatment is stopped when GCK-MODY is diagnosed but there are no formal studies establishing the impact of treatment in these patients. We aimed to investigate the number of patients with GCK-MODY who are receiving pharmacological treatment and the effect of this treatment on glycaemia using both cross-sectional and longitudinal studies. To investigate prevalence, in a cross-sectional study, we studied 820 patients with GCK-MODY, from 567 families, diagnosed at the Exeter Molecular Genetics Laboratory between December 1993 and July 2013, for whom treatment details were available. We excluded 21 patients with an HbA1c level above the range seen in GCK-MODY  to avoid the possibility of including patients with type 1 or type 2 diabetes. For the longitudinal study, we studied 16 consecutive patients with GCK-MODY, who stopped pharmacological treatment after a genetic diagnosis was made (insulin, n = 6; OHA, n = 10; follow-up details were available for all). For comparison, we studied a control group (n = 18) that was not receiving pharmacological therapy at the time of testing. Both studies were approved by the local research ethics committee. In the cross-sectional study we compared HbA1c, age at diagnosis and BMI in 799 patients on no treatment, OHA or insulin. For the longitudinal study we recorded patients’ HbA1c in the 6 months before discontinuing therapy (treatment stable for at least 3 months) and at least 3 months after stopping treatment. Both values were measured at the same laboratory. Doses of oral agents were calculated as a percentage of the total maximum dose, as previously described . Data are presented as medians with inter-quartile ranges (IQRs), except change in HbA1c, which is reported as mean and 95% CI. Differences in characteristics between those on and off treatment were compared using the Mann–Whitney U test. For paired analysis (i.e. changes on and off treatment in individuals), results were compared using the Wilcoxon test. Of 799 patients with GCK-MODY, 168 (21%) were on pharmacological treatment at the time of genetic testing. There were 60 patients (7.5%) on insulin and 108 (13.5%) on OHAs. There was no difference in HbA1c in the patients on pharmacological treatment and those not on treatment (median [IQR]: 48 [43, 51] vs 46 [43, 50] mmol/mol, respectively; 6.5% [6.1%, 6.8%] vs 6.4% [6.1%, 6.7%]; p = 0.11) (electronic supplementary material (ESM) Table 1). Patients on OHA treatment were older when diagnosed with diabetes (median [IQR]: 28 [18, 42] years) than patients on no treatment (17 [11, 30] years) or insulin (20 [8, 29] years) (p < 0.0001). BMI was higher in the OHA-treated patients (median 25.6 kg/m2) than in patients on insulin (23.0 kg/m2) or receiving no treatment (23.1 kg/m2) (p = 0.015). In the longitudinal therapy discontinuation study, patients were on low doses of treatment at referral. The median dose for the six insulin-treated patients was 0.2 U kg−1 day−1 (range: 0.1–0.8 units kg−1 day−1). In the ten patients on OHAs the median percentage of the maximum total dose was 33%, which equates to 660 mg of metformin or 5 mg of glibenclamide per day. Stopping treatment did not alter HbA1c (Fig. 1). When the 16 patients with GCK-MODY discontinued their pharmacological treatment, there was no difference between pre- and post-treatment HbA1c levels. The mean change in HbA1c was −0.68 (95% CI −2.97, 1.61) mmol/mol (−0.06% [95% CI −0.27%, 0.15%]), similar to that in the group of 18 patients who were not on treatment either prior to the genetic test or at follow-up (see ESM Table 2). Our studies show that, at the time of genetic testing, 21% of patients were on insulin or OHA treatment. Patients on pharmacological treatment did not have a lower HbA1c than those off treatment; when therapy was discontinued, HbA1c did not rise. This suggests that the pharmacological treatment received by patients with GCK-MODY does not alter their glycaemia. Our study is the largest description to date of treatment in patients with GCK-MODY, and 21% receiving pharmacological treatment is consistent with previous series . 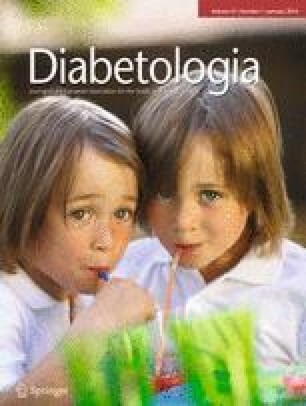 The patients on insulin treatment were usually diagnosed as children or adolescents, consistent with a misdiagnosis of type 1 diabetes. Conversely, the patients on OHAs were diagnosed later and had a higher BMI, so may have been thought to have type 2 diabetes. Patients with GCK-MODY who are on pharmacological treatment do not have a lower HbA1c. This could either represent a lack of action or indicate that glycaemia had been less well controlled in these patients prior to treatment and was well controlled as a result of the treatment. However, the lack of change in HbA1c (95% CI: −2.97, 1.61 mmol/mol; −0.27%, 0.15%) on discontinuing treatment suggests a lack of action is the most likely explanation. In keeping with this, in pregnancies of women with GCK-MODY, the birth weight of offspring is not altered by whether or not the mother is treated with insulin . The lack of a reduction in HbA1c by hypoglycaemic therapy is explained by patients with GCK-MODY having a glucose level that is regulated at its raised level. This is shown in OGTTs in which the glucose value rapidly falls towards the fasting level . Thus, if a small dose of exogenous insulin is given, there will be a compensatory reduction in endogenous insulin secretion without an alteration in glycaemia. The glucose level will only lower when a supra-physiological insulin dose is given. In our study, the doses of insulin and OHA were small and are unlikely to fully suppress endogenous insulin secretion. The lack of a glycaemic response to insulin or OHAs is an example of pharmacogenetics, where the genetic subtype determines treatment response. There is evidence of pharmacogenetics for other types of monogenic diabetes. Patients with hepatocyte nuclear factor-1α/-4α (HNF1A/HNF4A)-MODY are sensitive to low doses of sulfonylureas  and those with activating KCNJ11/ABCC8 mutations causing neonatal diabetes are best treated with high-dose sulfonylureas . Stopping pharmacological treatment as a consequence of identifying a GCK mutation is the first example of a genetic subtype leading to treatment cessation. This study was subject to limitations since it was an observational retrospective study of a relatively small number of patients. The ∼10% recruitment rate in the longitudinal treatment discontinuation study reflects that when patients are diagnosed with GCK-MODY and advised to stop treatment, they are often discharged from follow-up. The clinical characteristics of the patients included in our study are no different from those of the patients with GCK-MODY who were not followed-up (ESM Table 3). A prospective placebo-controlled randomised trial would provide the ideal study design, but would be difficult in view of the limited number of patients. This observational study is therefore important in the absence of such a trial. In summary, we have shown that in patients with GCK-MODY, treatment does not alter glycaemic control and is unnecessary. This study provides further evidence for the role of pharmacogenetics in diabetes care. ATH and SE are Wellcome Trust Senior Investigators. ATH is a National Institute for Health Research (NIHR) Senior Investigator. BS, ATH and SE are funded by the NIHR Exeter Clinical Research Facility. This article presents independent research funded by the European Community’s Seventh Framework Programme (FP7/2008-2012) under grant agreement number 223211 (Collaborative European Effort to Develop Diabetes Diagnostics, CEED3) supported by the NIHR Exeter Clinical Research Facility. The views expressed are those of the author(s) and not necessarily those of the NHS, the NIHR or the Department of Health. ATH designed the study. AS, OG-C, BS, AJC, KC, SE and ATH acquired and/or analysed the data. AS, BS, OG-C, AJC, SE and ATH wrote the manuscript. All authors reviewed and revised the manuscript critically. All authors approved the final version of the manuscript. ATH is the guarantor of this work and, as such, had full access to all of the study data and takes full responsibility for the integrity of the data.